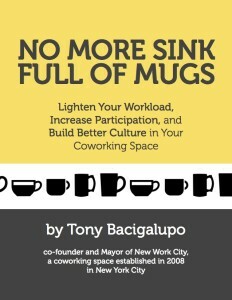 No More Sink Full of Mugs: A handy eBook to help keep coworking space managers from losing their minds. Anyone who’s ever run a coworking space knows that while it’s wonderfully fulfilling work, it’s also not without its un-glamorous and downright gross parts. Running a workspace every day is no easy undertaking; entropy creeps in at every opportunity. Things get messy. Culture shifts in unpredictable ways. Without careful management and smart tricks, the job can easily drive one to burnout. Since I first got started organizing coworking communities in 2007, I’ve learned the hard way that so much of what it takes to maintain sanity comes down to doing a lot of big and little things to make the community something that not just you, but everyone, can feel ownership over and permission to help make better. I realized that I could help people avoid a lot of the pain of learning how to handle things the hard way by writing down some of my favorite simple tricks and making them available in the form of a handy little eBook. And voila, here it is! I’ve been wanting to publish something for a long time now, so getting this out the door has been huge for me. It’s focused completely on practical solutions, with very little in the way of theory and fluff. In addition to all of this, I share eight key rules of thumb that can be applied to any of a number of situations. These basic philosophical approaches have been a core part of what’s allowed us to run an extremely efficient operation with a continuously strong culture for over seven years. It also comes with some handy templates and resources so you can implement the concepts in the book with minimal additional effort. It’s available for order now for $19.99. Jump on it! You’ll actually be quite happy!